If you are willing to learn how can we generate excel file by using jquery, so this is the right place in which I will learn you how to use jquery with php programming for export of html table data to Excel file. 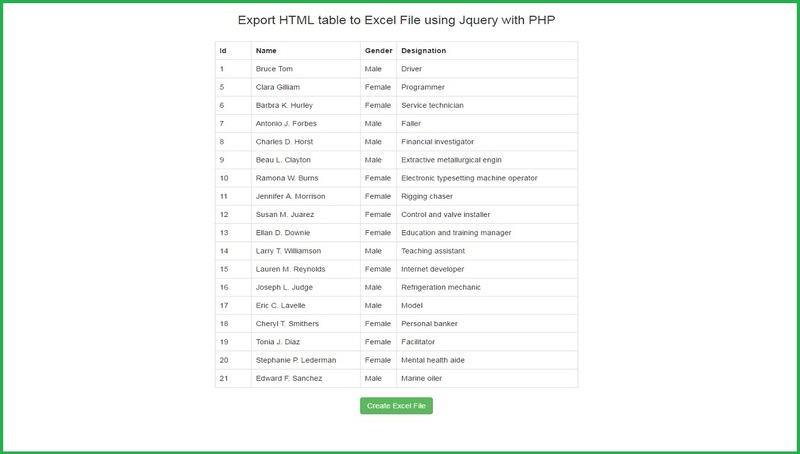 This is my short PHP web development tutorial in which We will talk about how we can use jquery code for export html table data to excel file format by using PHP. In number of web pages in your web application, you want to give one option for generate excel file from your html data table. With the help of this clean php code execute with the help jquery. You can efficiently build the functionality like export any type of html table data to excel file format by using php programming with Jquery. In this PHP web development tutorial first I will fetch data from mysql table and display that table data on the web page in html table and below html table I have put one button for export html table data to excel file. When user click on that button html data will be exported to excel file. I will jquery code on button click event. This code is working on most of the modern browser like a Old and New Internet Explorer, Google Chrome Fire Fox etc. I wish you have something learn from this post. can you share another way beside using method get? because I always get error 414 Submitted URI too large!